Texas Hold’Em has evolved into one of the most popular poker games in the world both online and offline. The game is believed to have originated in Texas but cannot be pinpointed to a specific location although the state of Texas has officially acknowledged the game’s birthplace as Robstown, Texas. Online poker has further increased the game’s popularity, providing players with easy, 24/7 access to Texas Hold’Em. This page was created to relay the advantages and disadvantages of online Texas Hold’Em for US players and to give insight on what to expect when playing online. Is Playing Online Texas Hold’Em Legal? Yes, there are no US federal gambling laws that make online poker illegal. Playing Texas Hold’Em online is allowed in 48 of 50 states excluding Washington and Connecticut. Those states have specific laws directed towards online gambling while the other 48 have no such legislation directed towards offshore online poker rooms. The following sites have been vetted by our team of industry professionals and determined to be the best options for USA online poker players. Each of theses sites are located offshore and have the legal licenses to service the US. In addition they all have a trusted reputation and multiple bonus options. When Playing Texas Hold’Em the dealer will give each player two cards face down. These cards are what you will use to place a bet. Three community cards are then drawn face up. The first three community cards dealt face up is known as the flop. After bets are placed, a 4th community card will then be dealt. This 4th community card is known as the turn. Players are then given a chance to raise their bet, call, or fold their hand. A 5th community card is then dealt (the River), players are given a chance to raise their bets, call or fold. The player with the best 5cards, including their two cards and 3 of the community cards, is declared the winner. Can I play Real Money Texas Holdem Games On Mobile Devices? Yes, thanks to the modern advances in mobile technology, playing Texas Hold’em, Stud poker, HORSE, or Omaha on a smartphone or tablet is easier than ever. Most sites have a responsive HTML5 design that will allow users to sign in on the homepage and play on a mobile device with just a few simple clicks. Are There Online Texas Hold’Em Bonuses? Yes there are poker bonuses online that can be utilized for playing Texas Holdem. These bonuses are one of the components that make online poker quite attractive since these offers are not usually found at brick and mortar poker rooms. There are several types of bonus options available, but if you are signing up for the first time the Welcome Bonus is what you should look for. The welcome bonus is known as the industry standard incentive and entails a deposit match up to a determined percentage. Reload bonuses, referral bonuses, and various tournament promotions and freeroll offers are also plentiful. Poker sites usually release their bonus funds in increments as the wagering requirements are met. Make sure to read the terms and conditions before accepting any online bonus offer. Button – The button or dealer button is a chip or button that represents who the dealer is. Everything in poker goes clockwise, so the player to the left of the dealer button would be known as the small blind, the player to the left of the small blind is known as the big blind. Blind – When playing poker there is a big blind and a small blind. The small blind is the player located to the immediate left of the dealer, the big blind is located on the immediate left of the small blind. Small and big blinds are the players who must throw in a certain amount to play a hand, that just gets the game started. Pre-Flop – After seeing the cards you were dealt, and the blinds have been paid, the player next to bet is the player to the left of the big blind. The player has the option to fold, call or raise the big blind. To calla player must match the big blind, to raise a player must bet more than the big blind. Betting before the community cards are dealt is betting on the pre-flop. The Flop – The first 3 community cards dealt by the dealer are known as the flop. The Turn – The turn is the 4th community card dealt by the dealer in a game. The River – The fifth and final community card dealt in a game. When someone says bet on the river, that means that all community cards have been dealt. The Showdown – The showdown occurs if there are more than one player left after the river. 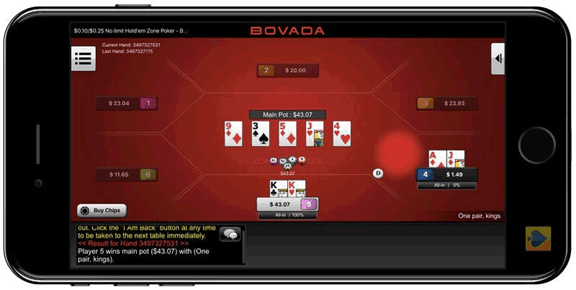 The last player to bet shows their cards first or if there is no bet in the last round the player closest to the dealer button’s clockwise side shows their cards first. Texas Hold’Em is a very popular legal online poker game and since it is so well known there are several different ways to play. The game is the same with a few exceptions, but the betting rules change across the variations of TexasHold’Em. Limit Texas Hold’Em – With Limit Texas Hold’Em betting is predetermined. Pre-flop and on the flop all bets are the same as the big blind. On the turn or the river, the bets and raises are double the big blind. 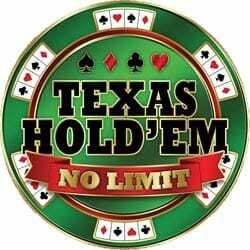 No Limit Texas Hold’Em – With No Limit Hold’Em the minimum bet is the same as the big blind bet, but players can bet a lot more if they want, hence the name No Limit. Pot Limit Texas Hold’Em – The minimum bet is the same as the big blind in Pot Limit Hold’Em, but players can bet up to the amount that is in the pot. When playing online there are some obvious differences. Online players open up a browser or in some cases download a poker program or interface to get to the platform where they can choose their preferred variation of poker. Online interfaces host a variety of tools including, cashier, poker variations, note taking, hand histories, and other casino-style games that can also be wagered on. When playing online there are a few major differences than when playing at a physical table with other players. For one, in online card games, you can’t see who you are playing against. A lot of seasoned Holdem players tend to look for tells or ticks that other players often give away when holding a good or bad hand. Online poker tells are completely different than face to face games. Online Hold’em can be played faster than face to face games and bets are often played more conservatively. Online there are multiple table options such as limit or no limit Hold’Em, there are multiple buy-ins such as micro, low, medium, or high, and players can also choose between a variety of other online poker games to play in the same visit. You can also play multiple hands at multiple tables simultaneously. If you have a strong knowledge of poker odds you will have a better chance of winning in the long run. The best way to calculate odds is to compare the number of unknown cards to the number of cards that can help you. For example, say you have pocket ace’s and there are 3 cards on the river, you can account for 5 cards. You know there are 2 more ace’s in the deck or in your opponent’s hand. Since there are 52cards, you now know that there are 47 unaccounted for cards since there are 2 more aces, your odds are approximately 23/1of drawing another ace.